Monet and Alice Hoschedé lived together with their children even before Camille Doncieux’s death. Monet proposed to her while her husband, Ernest Hoschedé, was still alive and in Paris, but she waited until his death in 1891 to agree. They were married that year. In 1883 Monet rented the house in Giverny where his most famous paintings were created. He used a barn as a studio and he had a small garden. There was a school nearby where he sent his two children by Doncieux and Alice’s six children. Mme Hoschedé’s presence was scandalous. Their living together in the house where Doncieux died could be explained away, but moving together was more difficult to explain. Ernest Hoschedé attempted to persuade her to join him in a quest to regain their lost fortune. She did not. Monet still exhibited with the Impressionists, but he decided to exhibit his work at other venues as well. He showed at the Salon for the last time in 1880, went solo at Galerie Durand-Ruel in 1883 and 1891, and a few times at George Petit’s Expositions Internationales de Peinture (once even traveling to New York). Impressionism was becoming a more accepted and popular form of painting and Monet was at the forefront of this wave, although the group had disbanded. Monet only showed at one more group exhibition in 1882, ignoring the others in 1880, 1881, ad 1886. His dealer Paul Durand-Ruel was selling more and more of his paintings. In November 1890 Monet could afford to not only buy his house, but to buy the surrounding buildings and land for his gardens. With this land he built a greenhouse and another studio. This studio suited his preference for painting “en plein air” (outdoors) because it was spacious and lit by skylights while satisfying his need to paint indoors occasionally. Starting in the 1880’s Monet worked on paintings with a similar motif, known as his “series” paintings. He would paint the same subject, but he would vary it with different light, weather conditions and points of view. These series include: Haystacks, Rouen Cathedral, Poplars, the Houses of Parliament, views of Charing Cross Bridge, Weeping Willows, Mornings on the Seine, and Water Lilies. Monet traveled to get different views and subjects for his paintings. Between 1883 and 1908 (In 1905 his first signs of cataracts appeared) Monet traveled to the Mediterranean, Venice, and London. When he traveled to the Mediterranean he painted landmarks, seascapes, and landscapes. He returned to London and painted the Houses of Parliament and views of Charing Cross Bridge. He journeyed to Venice, Italy with his wife, Alice. She usually did not go far from Giverny but she was invited as well by their friend Mary Hunter. Two weeks into their stay Hunter had to leave, so the couple moved to a hotel with electric lighting. Monet could easily see his work; they had electricity installed as soon as they returned to Giverny. Alice wrote that she was "happy to see Monet so impassioned, doing such beautiful things, and -between you and me- something other than those same old water lilies. "1 The cold made them leave Venice, as Monet was unable to paint outdoors. Soon Alice’s health began to fail. She died in 1911. 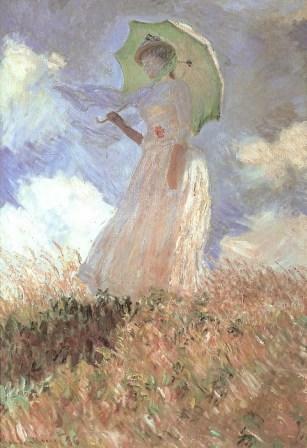 In 1912 Monet was diagnosed with nuclear cataracts. His oldest son, Jean, died in 1914. His son’s widow (and Alice’s daughter), Blanche would take care of him for the rest of his life. The Weeping Willows Monet painted were homage to the fallen French soldiers of World War I. This war affected Monet especially since his only surviving son, Michel, served. On December 5, 1926 Monet died. He had insisted that the ceremony be simple, so he was buried in the Giverny church cemetery. Only about 50 people attended the ceremony. His friend Georges Clémenceau insisted that the cloth thrown over the casket be floral, rather than black because Impressionists rarely use black in their paintings and it thus seemed inappropriate to have a sheet of black covering Monet.